How to Calculate Your Exact Hydration Needs? How to Calculate Your Exact Hydration Needs? When the temperature outside heats up, hydration becomes a big obstacle for distance runners. The running community in Minneapolis is indignant about malfunctioning drinking fountains at parks and along popular running trails which were damaged by frozen pipes over the winter. This has thrown off the regular hydration routines of countless local runners as the summer heat rolls in. Knowing what we know now about the latest research on hydration, dehydration, and performance, how should you structure your own hydration routine, and what’s the best way to figure out how much you need to drink? One of the most popular ways of measuring your water needs is by weighing yourself before and after you run, then calculating the difference. It seems fairly basic: if you go out for a run in the heat, you sweat out a lot of water and need to replace it. If you use this simple equation you’ll be getting it wrong. In this article we’ll look at the research and help you develop both a super-simple method and a more scientific calculation for exactly how much you need to hydrate. Under the conventional and dated model, to figure out how much you sweat, you simply measure how much weight you lost over the course of your run. But scientific research has shown that there are a few problems with this model. First, not all of the weight you’re losing is water! A significant portion is fuel—carbs and fat, burned for energy during the course of your run. A figure of 120 calories per mile is about right for most runners. So, for example, over the course of an eight or nine-mile run, you’d expect to burn about 1000 calories. If you are running at an easy pace, about half of these calories will come from carbs, and the other half will come from fat. After doing some math on the energy content of carbs and fat, you’ll find out that you’ll be losing almost half a pound of fuel during your run. On top of this, a wide body of research has established that your body stores water alongside glycogen, the molecule carbohydrates are converted into for storage. In one representative study by Karl-Erik Olsson and Bengt Saltin at the Karolinska Institutet in Sweden, 19 healthy subjects had their total body water and muscle glycogen content measured before and after a three-day period during which they consumed only fat and protein, depleting their body’s carbohydrate stores. Following this, the subjects ate a carb-rich diet again for four days and the measurements were taken again. Olsson and Saltin demonstrated a fluctuation in body water content according to the concentration of glycogen stored in the muscles, to the tune of three to four grams of water per gram of carbohydrate. For a runner in the summer, this means that each gram of carbohydrates that you burn liberates a few grams of water which can help maintain your hydration level, even though you’re losing water to sweat. Timothy Noakes, a South African exercise physiologist and medical doctor, has demonstrated in several studies that athletes can lose at least 2.2 pounds of weight during exercise, and possibly up to 4.4 pounds, without any measurable decrease in hydration, as measured by total-body water content. Additionally, Noakes points out that runners seem to have differing levels of sensitivity to water loss. Some become extremely thirsty after only a pound or two of body weight lost, while others lose up to 8% of their body weight during a race, even when they’re drinking water en route! Some multi-hour ultramarathon events feature weight checks at intermediate points along the course, but primarily to prevent overhydation in the form of hyponatremia, a dangerous condition that results from drinking too much water or sports drink. Runners who develop hyponatremia often drink so much that they put on weight over the course of their run. What about urine color, another popular method of checking your hydration level? Unfortunately, that too fails to pass scientific muster. A 1999 study by three researchers at Maastricht University in the Netherlands compared the color and volume of urine production in eight trained cyclists before and after a long cycling session in the heat which led to a 3% loss in body weight. While it is true that urine color and output followed the trends we’d expect—a small amount of dark yellow urine immediately after exercise, then increasingly clear urine and larger volumes produced as the subjects rehydrated—neither the color of the urine nor its volume were statistically correlated with the amount of water in the body. In fact, the only scientifically valid measurement of hydration is the concentration of your blood plasma, which is not exactly easy to measure. So what’s a runner to do? Fortunately, there are two solutions. One of them pretty simple and one a little more complicated, but perhaps a little more useful for those racing marathons. The best hydration plan, both for performance and for health, is to listen to your body. When you’re thirsty, drink water, and if not, don’t. This is easy to do on a treadmill, or along a running path with frequent drinking fountains, but it’s a little trickier if you’re doing a big loop on the roads. Most runners find that they need 13-27 fluid ounces of water per hour of running to keep from getting thirsty, so that’s a decent starting point if you’re stashing water bottles on your long run route or carrying a fuel belt. The only drawback to drinking to thirst is that it’ll take you a few tries to figure out when and how often you’ll need water. Developing a calculation that factors in your carbohydrate and fat burned while also compensating for glycogen storage and actual sweat loss is a bit complicated. That’s why we created a calculator to let us do the hard work for you. Download your FREE Sweat Rate Calculator now in your members-only download section. If you are unsure about how to calculate how much water to consume, and electrolytes to use, this will give you your exact needs. Step 2: Calculate percentage of calories burned from fat and carbohydrates. This is a reflection of intensity. This is a relatively complicated calculation, but if you want the in-depth details check out the article we did on this earlier here. Step 3: This will give you how many grams of carbs and fat you burned. Step 5: You can now subtract the value from how many grams of carbs and fats you burned from total weight loss. The difference is how much sweat you lost. Why the heck would anyone want to use this method? Other than the fact that most runners love data and are obsessive-compulsive by nature, there is a really good reason! If you’re running the marathon, knowing exactly how much you need to drink is critical to determining exactly how much, when, with what and how often you need to refuel. Since we know the body can only process a finite number of carbohydrates per minute/hour, you need to factor that into how much carbohydrate beverage and how much gel you’re taking. As an example, if you choose to drink to thirst and thus drink 20 oz of sports beverage in an hour, you’ll also be consuming 20 to 35 grams of carbohydrates – depending on your exact drink of choice. But, let’s say the next hour of the race you’re not as thirsty and you only drink 10oz of sports drink. Now, you’re only consuming 10-15 grams of carbohydrate. That means you need to make up that carbohydrate deficit somewhere or you risk bonking. On the flip side, you could also be planning to take a gel every 45 minutes during the race. But, if you drink more because you’re thirsty, you could end up exceeding your body’s limit of carbohydrate processing. This is what leads to an upset stomach, bloating and even potentially a shut down of the digestive system. Or, what if the weather changes – you’re going to drink more during a warm marathon than a cool one. How do you adjust your fueling plan then? But, if you know exactly how much you need to rehydrate with every mile for any given temperature, then you can plan this into your marathon nutrition strategy. The calculation ensures you get your fueling right 100% of the time, regardless of weather. 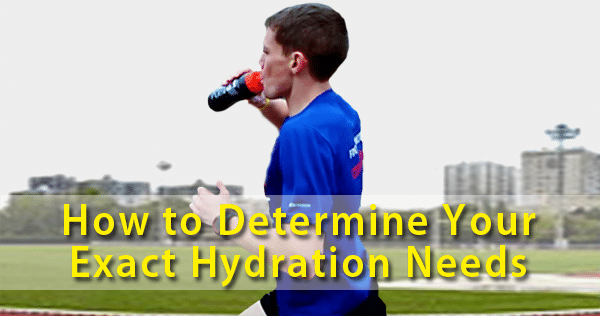 That’s why we include the hydration calculator in the Marathon Nutrition Blueprint. We do all the calculations above for you. You just weigh yourself before and after you run and we do the rest. Then, we use your specific hydration needs to create a personalized plan. If you want to learn more, you can check out the full details of the blueprint here. Regardless, use this info as you train this summer and as you begin to develop your marathon nutrition strategy for this fall. If you’re just training, drink to thirst. It’s simple, easy and effective. If you’re training for a marathon, let the numbers guide you to ensure you factor in all the variables. 2. Olsson, K.-E.; Saltin, B., Variation in Total Body Water with Muscle Glycogen Changes in Man. Acta Physiologica Scandinavica 2008, 80 (1), 11-18. 3. Noakes, T. D., Waterlogged: The Serious Problem of Overhydration in Endurance Sports. Human Kinetics: 2012; p 448. 4. Kovacs, E. M.; Senden, J. M.; Brouns, F., Urine color, osmolality and specific electrical conductance are not accurate measures of hydration status during postexercise rehydration. Journal of Sports Medicine and Physical Fitness 1999, 39 (1), 47-53. 5. Cheuvront, S. N.; Ely, B. R.; Kenefick, R. W.; Sawka, M. N., Biological variation and diagnostic accuracy of dehydration assessment markers. American Journal of Clinical Nutrition 2010, 92 (3), 565-573. Thank you for writing a useful article about a difficult subject!